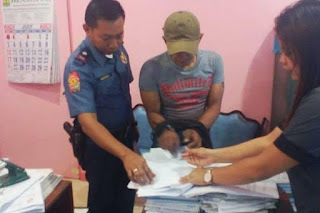 Negros Occidental - A police officer who had been AWOL (Absent Without Leave) was arrested in a buy-bust operation yesterday afternoon in Binalbagan, Negros Occidental. According to Binalbagan Police Chief Insp. Lester Leada, another cop posing as a buyer was able to purchase a small sachet of shabu worth PhP200.00 from PO3 Matt Alvaran. Police recovered from a caliber .38 revolver loaded with five ammunition from Alvaran and two more sachets of shabu were also found in his underwear. PO3 Alvaran was assigned to the Bacolod City Public Safety Company but has a pending dismissal order on his administrative case for serious neglect of duty. He was also arrested last May for violation of RA 9165 and Republic Act 7610 for provoking a minor to use illegal drugs, but was able to post bail.